In the past, if you lost a tooth there weren’t that many options to replace it, let alone options that offered permanent replacement solutions. Thankfully because of dental implants, there now is a permanent tooth replacement solution available to many of those who have suffered from tooth loss. 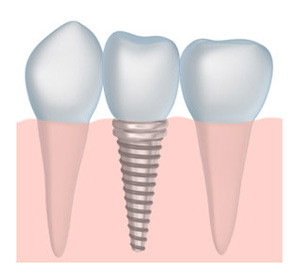 A dental implant is a special synthetic post usually made of titanium that is inserted into the jaw. This post acts a lot like a natural tooth root does, and allows us a permanent anchor point for a variety of dental devices. Once the implant is placed, our team can carefully restore a beautiful porcelain crown to your dental implant, which creates essentially a ‘new’ tooth. Strength | When you lose one of your natural teeth, it leaves a gap in your jawbone where your tooth root used to be. Frequently this can result in the weakening of your jawbone, and deterioration of structure over time. A dental implant can restore some of this structure, because it acts to fill in the gap left by a missing tooth root, providing strength and long lasting results. Performance | Because dental implants are anchored into the jawbone, they frequently perform better than other options for tooth replacement. This is because they have more strength than many other alternatives and do not put pressure on surrounding teeth like a dental bridge may. Permanence | Dental implants, unlike some other tooth replacement options are a permanent tooth loss solution, and are made to provide years of service with great functionality. Versatility | Dental implants are a versatile tooth replacement solution because they can be used in more than one way. Not only can they be used to replace single missing teeth, they can also be used as anchor points for permanent dentures that do not suffer from many of the pitfalls of traditional dentures. Here in Rock Springs, we are thrilled to be able to offer this wonderful dental technology to our patients who have lost teeth and are ready to answer the questions you have. If you have any questions about dental implants or any of our other high-quality dental services, you can give us a call at 307-382-2707 to contact our team today!